At least 15 persons were killed in rain-triggered flood and landslides across Garo Hills area in Meghalaya and Guwahati city in Assam today. The government is planning to tackle the post-harvest wastage in a big way. Talking about the initiatives taken by her ministry in the first four months in the government, Food Processing Minister Harsimrat Kaur Badal said she has asked the Central Institute of Post-Harvest Engineering and Technology (CIPHET) to conduct a fresh study on post-harvest losses in crops surveyed around four years ago. The BJP is seeking suggestions from the public to prepare its manifesto for the October 15 Assembly elections by using social media and conducting public meetings at various parts of Maharashtra. Former Railway Minister Pawan Kumar Bansal today told a special court that his nephew Vijay Singla, facing trial in the Rs 10 crore cash-for-post railway bribery case, “never spoke” to him on the appointment of accused Mahesh Kumar, then a Railway Board member, to any post. Deposing as a prosecution witness in the case, Bansal said Singla, chargesheeted by the CBI for allegedly demanding Rs 10 crore from Kumar for his appointment as Member (electrical) in the Railway Board, had visited him thrice during his tenure as the Railway Minister but never talked about Kumar’s appointment. The Supreme Court today issued notice to the Centre on a PIL for taking urgent steps to prevent suicide by farmers by addressing their problems of mounting loans and input costs and diminishing returns. Hectic deliberations were going on in the Congress today with the party working hard to save its 15-year-old alliance with the Nationalist Congress Party (NCP) in Maharashtra. The Haryana Lokayukta today reserved its order on a petition against Haryana Health Minister Rao Narinder Singh and four other MLAs accused of demanding money in lieu of grant of change of land use (CLU) permission. The Supreme Court today accepted a plea for a review of its order for disclosure of the name of the whistleblower as a pre-condition for going into the allegation that CBI Director Ranjit Sinha had tried to botch up the probe into the 2G scam by receiving some of the accused and their associates at his official residence several times. he Supreme Court today ruled that government servants can expose maladministration by filing PILs and no departmental action can be taken against them for doing this. The CBI today arrested Odisha’s former advocate general Ashok Mohanty for alleged links with Artha Tatwa Group, a ponzi company accused of duping investors of crores of rupees in the state. The CBI on Monday faced the ire of a special court here for filing a “vague” report on a plea for return of passport by an accused in a coal blocks scam case with the judge warning the investigating officer (IO) that cost would be imposed on him in future. After being rapped by the Supreme Court for its approach to clean Ganga, the Narendra Modi government has placed before it a blueprint of short, medium and long-term measures spread over 18 years and thousands of crores of investment to restore the glory of the river. Hours after the Home Ministry ordered a probe into reports that employees of an Ahmedabad hotel from the northeast were asked to stay away from duty during Chinese President Xi Jinping's recent visit, the city police and hotel management have denied issuing any such instruction. Prime Minister Narendra Modi will observe a strict religious fast during his maiden trip to the United States, aides said on Monday, in a test both of the 64-year-old leader’s stamina and of protocol in the Obama White House. As India’s stand-off with China at Chumar in southeast Ladakh continues, Army Chief General Dalbir Singh Suhag has called off his four-day visit to Bhutan scheduled to start on Monday. He is expected to visit the neighbouring country later. Twelve persons were killed in Meghalaya’s Garo Hills, while three died in Guwahati city. Sources said of the 12 persons who died in Meghalaya, seven died in South West Garo Hills district. The Deputy Commissioner of the district said three persons lost their lives at Banduraja village near Betasing due to rain-induced landslide, three died due to flood at Bolchugre and one at Chipragoan village. He said Dilni, Ganol and Daru rivers, all tributaries of Brahmaputra, were flowing above the danger level after continuous heavy rainl in the district for over eight hours today. He said over one lakh people from about 200 villages in the district had been affected so far. Eight flood relief camps were set up by the administration and the BSF. Dainadubi and Bajengdoba areas in North Garo Hills district were submerged where five persons were killed due to landslides in Bugakol village. Over 100 villages in Bajengdoba area in North Garo Hills were submerged. A bridge connecting Mendipathar and Resubelpara was washed away. In West Garo Hills, the Ringgi bridge, which connects to civil sub-division office in Dadenggre, was washed away. 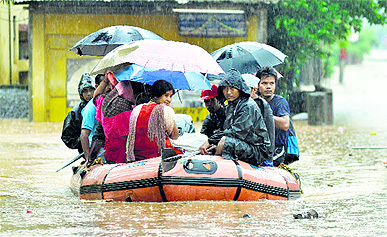 Over 1.5 lakh people were affected by flood in the district. In South Garo Hills, several localities in Baghmara town were flooded and low-lying areas remained completely submerged. Officials said over 70,000 people were affected. The Williamnagar town in East Garo Hills remained cut off due to heavy landslides in Samanda, Rongjeng, Darugre and Baiza area. The downpour has disrupted power supply across Garo Hills. Three persons died in Guwahati city of Assam — one due to flood at Lokhora area, another due to landslide at Lichubagan area in the city and the third was electrocuted in flood-hit Lal Ganesh locality, a senior official said. The district administration has instructed all schools in the city to ensure safe return of students in view of flash floods in many parts of the city and ordered closure of schools till the situation improved. In view of the worsening situation in Dhubri and Goalpara districts, CM Tarun Gogoi today directed Chief Secretary Jitesh Khosla to take all possible measures to rescue the marooned and to provide relief and rehabilitation to the flood-hit people. Border Security Force (BSF) personnel are working in tandem with the district administration to evacuate those affected. A CIPHET assessment of harvest and post-harvest losses for 46 agricultural produces in 106 randomly selected districts in 2010 had shown post-harvest wastage varying between six and 18 per cent. “Our aim is to reduce these losses sharply,” Harsimrat said. The institute has been asked to conduct a fresh survey on the same crops in the same districts to ascertain the impact of new infrastructure in reducing the wastage in the interim period. She said based on the results, which are expected by January, the government will draw up technology-aided area-specific plans to cut down post-harvest losses. “Food worth Rs 44,000 crore is wasted annually. Food wastage is one of the causes of inflation. Prime Minister Narendra Modi is clear that the food wastage has to be brought down,” she said. Other initiatives taken by the ministry include Rs 2,000 special fund to provide affordable credit to agro-processing units, help desk “Investors portal” to assist prospective investors to facilitate investment in food processing sector, skill development in seven sectors to train 10,000 people in 12 years and drawing food maps of the country to identify areas of surplus raw material for processing. Harsimrat said the government would approve 17 food parks across the country over the next few months. A mega food park project at Tumkur is being inaugurated by the PM on September 24. Parks one each at Fazilka in Punjab, Murshidabad in West Bengal and Khargone in Madhya Pradesh will be completed by the end of this year. The government had sanctioned 20 new cold chain projects and was also exploring the new scheme for infrastructure and cluster development, she said. “We have sought ideas from everyone for the development of Maharashtra,” party spokesperson Madhav Bhandari said. Drawing on its Transform India online campaign that was used in the Lok Sabha poll, the Transform Maharashtra initiative hopes to connect with voters in the state. “This circle (portal) provides citizens of Maharashtra a platform to give inputs on what is needed in the state to improve urban daily life and local governance,” the BJP said in a statement. It said all inputs submitted would be reviewed and considered to prepare the BJP’s election manifesto. “If the BJP is elected to run the state, this circle would enable citizens to participate in governance and track the performance of the elected government against the manifesto,” the BJP said. 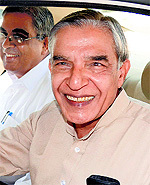 Former Railway Minister Pawan Kumar Bansal today told a special court that his nephew Vijay Singla, facing trial in the Rs 10 crore cash-for-post railway bribery case, “never spoke” to him on the appointment of accused Mahesh Kumar, then a Railway Board member, to any post. Deposing as a prosecution witness in the case, Bansal said Singla, chargesheeted by the CBI for allegedly demanding Rs 10 crore from Kumar for his appointment as Member (electrical) in the Railway Board, had visited him thrice during his tenure as the Railway Minister but never talked about Kumar’s appointment. “Accused Vijay Singla never spoke to me about the appointment of accused Mahesh Kumar for any post,” Bansal told Special CBI Judge Swarana Kanta Sharma. A Bench headed by Justice HL Dattu sought the response of the Union Agriculture Ministry to the contentions of PIL petitioner, Punjab’s Youth Kamal Organisation, that suicide by farmers was going on unabated with one farmer ending his life every 32 minutes. More than 2.5 lakh farmers had resorted to this extreme step since 1997, the PIL pleaded. There was no decline in the trend despite the government’s claim that it was implementing the National Policy for Farmers 2007, finalised on the recommendations of the MS Swaminathan committee approved by a Working Group of Chief Ministers, the petitioner said. Among the farmers’ problems highlighted in the PIL were unavailability of timely credit at affordable interest rates, high cost of seeds, fertiliser, insecticides and power and lack of technology, crop insurance, rural infrastructure and minimum support price. Further, agricultural and forest land continued to be diverted to the corporate sector for non-farm use, while women had no land rights despite the fact that they constituted over 50 per cent of the agricultural work force. In the absence of direct access to consumers, farmers were left at the mercy of middlemen and traders who took away a “disproportionately large share of the market price,” said the PIL. Congress president Sonia Gandhi today chaired two meetings at her residence to discuss the matter with sources admitting the alliance “was on razor’s edge”. The party’s Central Election Committee is learnt to have discussed all 288 seats to stay ready for the battle in the event of a last-minute split. The Congress and the NCP were as of tonight bargaining hard over the seats. The bone of contention between the two is the 50:50 seat-sharing formula proposed by the NCP for a pre-poll tie-up with the Congress this election. Congress strategists feel the Sharad Pawar-led outfit was being unreasonable in demanding 144 seats —which is a 30 seat jump over the 2009 elections when the NCP fought on 114. “We both performed poorly in the Lok Sabha polls. This jump cannot be justified,” Congress sources said. The Congress, while staying firm on its offer of 124 seats to the NCP, today decided to watch the developments on the rival BJP-Shiv Sena side. Congress sources said, “If the BJP-Sena alliance breaks and our alliance stays, we will have an edge. Any alliance will have an edge against the opposite side which goes alone.” They described as remote the possibility of the four big players (Congress, BJP, NCP and Shiv Sena) in Maharashtra going it alone. On seat sharing, the Congress, following its internal deliberations based on the inputs from Maharashtra CM Prithviraj Chavan, state Congress chief Manikrao Thakre and other top leaders, today decided that it would concede 130 seats to the NCP, “If push came to shove and would go no further”. Conceding 130 seats would mean 16 additional seats to the NCP as against 2009. The number of seats is critical because the number would, in the event of the alliance winning the election, determine which party will claim the CM’s post. “The issue is the CM’s post even on the BJP-Sena side. The alliance partner with higher seats will have a larger claim on the CM's post. That explains the bargain,” sources said. Sources said the Lokayukta reserved the order after the conclusion of arguments by both sides in which Rao Narinder and other MLAs questioned the authenticity of the video clips released by the Opposition. The clips show them demanding money for getting CLUs. Earlier, the Lokayukta had directed CPS Vinod Bhayana, Raita MLA Jarnail Singh, Barwala MLA Ram Niwas Ghorela and Uklana MLA Naresh Selwal to file affidavits whether they were ready to give voice samples to determine the authenticity of the videos. A Bench said it would take the views of senior advocate Anand Grover, the SC-appointed Special Public Prosecutor for the 2G trial, on a fresh application filed by the Centre for PIL (CPIL) seeking recall of the apex court’s September 15 order on the whistleblower. It asked Grover to give his opinion by October 10 when the case would come up for next hearing. Arguing for CPIL, senior advocate Dushyat Dave pleaded that his client had handed over the CBI Director’s guest entry register to the Bench as the SC had clarified earlier that it would not allow anyone to impede or interfere with the trial. CPIL was only trying to show that the SC order was being defied by the CBI chief. If the Bench had any doubt on the authenticity of the register which contained details of the visitors to Sinha, it could order a probe as pleaded by the CPIL instead of putting a pre-condition for the disclosure of the whistleblower in compliance with SC rules, Dave contended. He cited apex court judgments to show that rules should be allowed to hinder dispensation of justice. Sinha’s senior counsel Vikas Singh argued against entertaining the recall plea, contending that the CPIL had questioned the integrity of the judges by refusing to disclose the name of the whistleblower despite the assurance that the sealed cover containing the information would be opened only by the Bench. CPIL had filed an affidavit on September 18, stating that it would not expose the whistleblower as several such persons had been killed in the past after their identities were revealed. “The right to judicial remedies for the redressal of either personal or public grievances is a constitutional right of the subjects (both citizens and non-citizens) of this country. Employees of state cannot become members of a different and inferior class to whom such a right is not available,” a Bench comprising Justices J Chelameswar and AK Sikri held. The SC slapped a penalty of Rs 5 lakh on the Centre and the Uttar Pradesh Government for proceeding against IAS officer Vijay Shankar Pandey for violating conduct rules by being a member of an NGO, India Rejuvenation Initiative which had filed a PIL in the apex court, pleading for steps to bring back black money estimated at $1.4 trillion (Rs 65 lakh crore) stashed in foreign banks. The penalty would go to Pandey as litigation cost. Pandey had come to the SC after losing his case in the Allahabad High Court. The SC Bench ruled that the conduct rules only prohibited the criticism of government policies or any statement that would affect the relations between India and other countries and the Centre and the states. “We are at a loss to comprehend how the filing of the writ petition (PIL) containing allegations that the Government of India is lax in discharging its constitutional obligations of establishing the rule of law can be said to amount to either failure to maintain absolute integrity and devotion to duty or indulging in conduct unbecoming of a member of the service,” it said. “The purpose behind the (departmental) proceedings appears calculated to harass the appellant since he dared to point out certain aspects of maladministration...The whole attempt appears to suppress any probe into the question of black money by whatever means, fair or foul,” the SC said, pointing out that it had ordered an independent inquiry in the light of the PIL. It pointed out that the Constitution had declared that India was a sovereign democratic republic. The requirement of such a republic “is that every action of the State is to be informed with reason. The State is not a hierarchy of regressively genuflecting coterie of bureaucracy,” it explained while allowing Pandey’s appeal. Mohanty was picked up from his residence in Cuttack, sources said, adding the former advocate general was immediately taken to hospital for medical check-up. Special CBI Judge Bharat Parashar was unhappy with the CBI’s compliance report on service of notice to the passport officer, Nagpur, and observed that the document placed in the court was “not proper” and “vague”. “A bare perusal of the entire report and other documents shows that the report is per say vague. It does not say as to whom summons were served and except the word served, there is no other word written on it. “The IO has been warned that in future the report should be in pursuance to rules and procedures of the CrPC,” the court said. The court had earlier issued a notice to the passport officer concerned at Nagpur on a plea filed by accused Manoj Jayaswal, Director of co-accused firm Nagpur-based AMR Iron and Steel Pvt Ltd, seeking return of his passport seized by the CBI during the investigation. The court’s observation came while hearing a case in which Rajya Sabha MP Vijay Darda, his son Devendra Darda, Manoj Jayaswal and the firm were chargesheeted for offences under sections 120-B (criminal conspiracy) read with 420 (cheating) of the IPC and under the Prevention of Corruption Act. During the hearing today, the judge was annoyed as to why the CBI had not filed a proper compliance report and warned the IO that it would impose cost on him and it will be deducted from his salary. The NDA government submitted that it had identified 118 towns on banks of the Ganga as a first target to achieve total sanitation, including water waste treatment and solid waste management. “It is respectfully submitted that in order to ensure rejuvenation of the Ganga, the action plan envisages phase-wise timeline in terms of short term (a period of three years), medium term (next five years) and long term (next 10 years and more),” the affidavit filed in the Supreme Court said. It said timeline for completion of ongoing projects had been prepared after consulting five Ganga basin states primarily responsible for implementation of projects for rejuvenation of the 2,500-km-long river. “In the first stage, 118 towns have been tentatively identified for necessary interventions to achieve total sanitation targets, including water waste treatment and solid waste management,” it said. “Seven riverfront locations have been identified by the Ministry of Water Resources, River Development and Ganga Rejuvenation for development of ghats at Kedarnath, Haridwar, Varanasi, Kanpur, Allahabad, Patna and Delhi.” As a medium-term goal, it said 118 urban habitations on the banks of the river had been identified for extending coverage of sewerage infrastructure and make 1,649 gram panchayats free from open defecation. The long-term plan will emerge from the Ganga River Basin Management Plan bring drafted by seven IITs for 'restoring wholesomeness' of the river. Throughout a gruelling schedule that features the United Nations General Assembly, a rally of Indian Americans at New York’s Madison Square Garden and talks with Obama in Washington, the devout Hindu will abstain from food. In keeping with the habits of a lifetime, Modi will restrict himself to a “liquid diet” throughout the Navratri. “He will only consume lemonade with some honey and a cup of tea every day,” a senior official in Modi’s office in New Delhi told Reuters. “He has been fasting for the last four decades and does not want to change this pattern even while he is travelling,” said the official, who spoke on condition of anonymity. Millions of Hindus fast, pray and dance to please the mother goddess during Navratri, which falls this year from September 25 to October 3. The festival spans Modi’s first trip to the United States since he won the General Election in May. Meanwhile, the Army numerically dominates almost all positions at Chumar where it is locked in a face-off with Chinese People's Liberation Army since September 10. 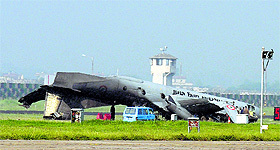 New Delhi decided to ramp up its troop presence in the disputed area on September 19, asking the force to stay put till the PLA withdraws into areas held by it in Chepzi (Zhipuqi-Quebusi). China may retaliate by increasing the number of soldiers there, say sources. In Beijing, Chinese President Xi Jinping, who is also the chairman of the Central Military Commission, attended a meeting of Chiefs of Staff of the PLA today. The Chinese Defence Ministry website quoted Jinping as saying: "Headquarters of all PLA forces should improve their combat readiness and sharpen their ability to win a regional war in the age of information technology." As both sides blame the other for violating the sanctity of the Line of Actual Control (LAC) and the 2005 protocol that bars any troop build-up or construction in disputed areas, sources say a final resolution to the stand-off depends on "who blinks first". A final decision to end the face-off will have to come from New Delhi and Beijing as the local military commanders have exhausted all options. The two sides will have to agree to a formula that seems workable for both. The events are being closely watched in Washington, Moscow, Tokyo and Islamabad. During the April-May 2013 stand-off at Depsang Plains, China had agreed to withdraw after India decided to remove some sheds it had erected at Chumar. Depsang and Chumar are separated by 650 km. Armed soldiers are strung across on an east-to-west axis in a 2 km-wide arch, maintaining a distance of 700m to 1.5 km, depending upon the terrain.